I've been a frequent visitor of Byron City Cemetery (Georgia) for several years now. 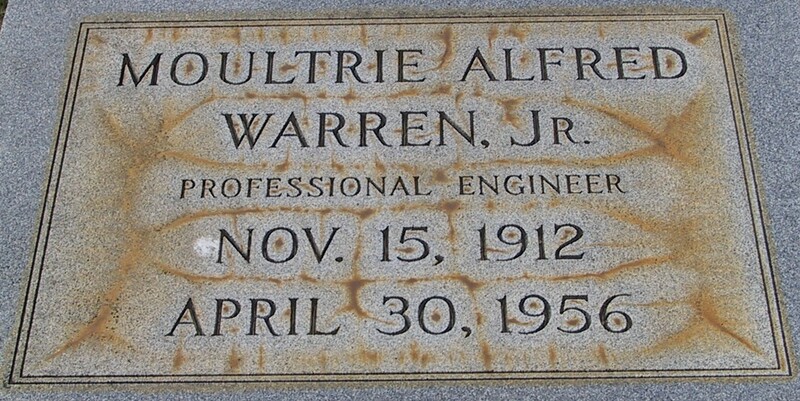 And every visit includes stops by the graves of cousins, one being that of Moultrie Alfred Warren, Jr. He was a third cousin of mine by way of his mother, Sadie Almira Peavy Warren. Engraved on Moultrie's ledger marker, in addition to his birth and death dates, is "Professional Engineer." And those aforementioned dates reveal Moultrie died at the young age of 43 in 1956. I have often wondered what was the cause -- now I know. 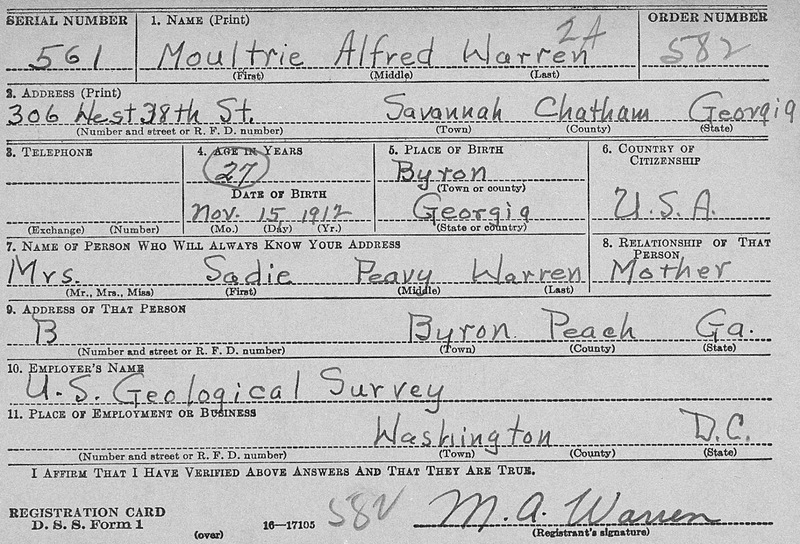 A World War II draft registration card from 1940 shows a 27 year old Moultrie Alfred Warren, Jr. living in Savannah, Chatham County, Georgia and employed by the United States government and the science organization of Geological Survey (USGS). In 1947, Moultrie became engaged to Ruth Tomlinson, daughter of Homer R. Tomlinson. Moultrie and Ruth were a very studious couple. Ruth was a graduate of Winthrop College (Rock Hill, SC). She also attended the graduate schools of the Universities of South Carolina and Florida, as well as studied at Bellevue Hospital and Cumberland Hospital in New York. Moultrie and Ruth had one son, born in 1950. SAVANNAH, Ga. (AP) -- The head of the U. S. Geological Survey office was beaten to death with a window sash weight Monday by a fellow geologist whose work he had criticized, police reported. The body of Moultrie A. Warren Jr., 40, Savannah, was found in his Customs House office after Coast Guardsmen in a recruiting office across the hall heard a scream and investigated. Police quoted the Coast Guardsmen as saying Fred B. Hudson, 35, a geologist formerly of Lincoln, was striking Warren with the sash weight when they rushed in. 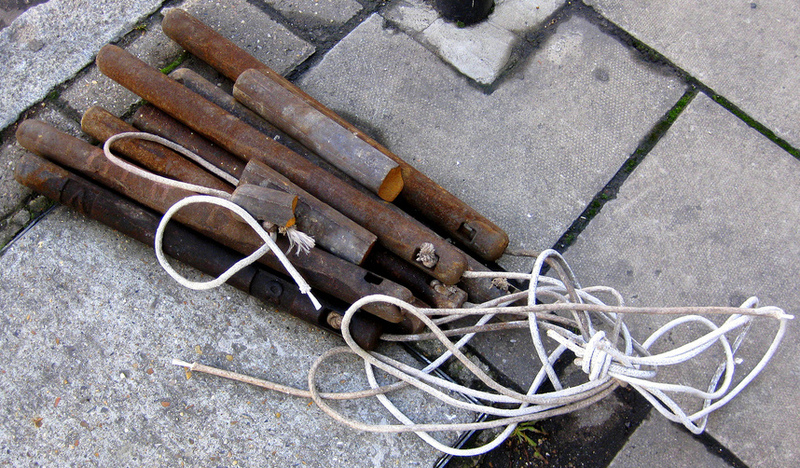 Hudson, who came to Savannah from Lincoln in 1954, was arrested on a warrant charging that he "hit Warren on the head with an iron sash weight with malice aforethought, thereby killing him within the confines of the U.S. Custom House." Hudson was given a hearing before U.S. Commissioner William A. Wells Jr. No request was made for bond. Wells said Hudson pleaded guilty and quoted him as saying he killed his superior because Warren had been "harassing" him over a period of months and casting reflections on his ability as a geologist. Investigators said the two men had been working together since the geological survey was set up in Savannah in 1954 and quoted workers in the building as saying there had been no previous indication of bad feelings between them. Warren was married and had one child, a son. Hudson was single. Hudson studied a general geology course at the University of Nebraska and also took graduate work there. His University instructors said he had a "general breakdown" during an interruption in his studies before he left Lincoln in 1954. SAVANNAH -- Frederick B. Hudson, former professor at the University of Nebraska, will undergo a sanity hearing here Wednesday to determine if he is mentally competent and able to stand trial for the death of a government worker in 1956. Hudson, 39, has been held in the Chatham County jail since arriving from the U. S. medical center in Springfield, Mo. The former professor is charged with the death of Moultrie A. Warren, Hudson's superior in the customs building in Savannah at the time of the slaying. Hudson...was committed as mentally ill after the death of Warren, bludgeoned with a window sash weight in April 1956. So, was the confessed killer ever put on trial? Um, I don't know. I'll have to keep digging! 1. "Tomlinson Engagement Is Announced," Richmond Times (Virginia), 27 April 1947; digital image, GenealogyBank (http://www.genealogybank.com : accessed 3 April 2013), Historical Newspapers. 2. 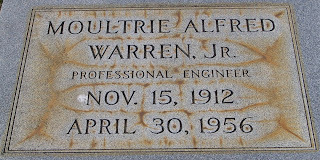 "U.S. City Directories, 1821-1989 (Beta)," database and images, Ancestry.com Operations Inc., Ancestry.com (http://www.ancestry.com : accessed 3 April 2013), entry for Moultrie A. Warren, 1955 Savannah, Georgia. 3. "Ex-Lincolnite Held In Georgia Slaying," Lincoln Star (Nebraska), 1 May 1956; digital image, Ancestry.com (http://www.ancestry.com : accessed 3 April 2013), Historical Newspapers Collection. 4. "Ex-Professor's Sanity Hearing Set," Marietta Journal (Georgia), 13 September 1960; digital image, GenealogyBank (http://www.genealogybank.com : accessed 3 April 2013), Historical Newspapers.